RACE MATTERS: “I like to support new events and help grow the sport all over the world,” offers track-and-field ambassador Usain Bolt ahead of competing at the 5th edition of the LOTTO Warszawski Memorial in the Polish capital of Warsaw on August 23. The meet is the latest addition to the Olympic legend’s summer itinerary, which had included assignments in Ostrava and Paris, among other global destinations. 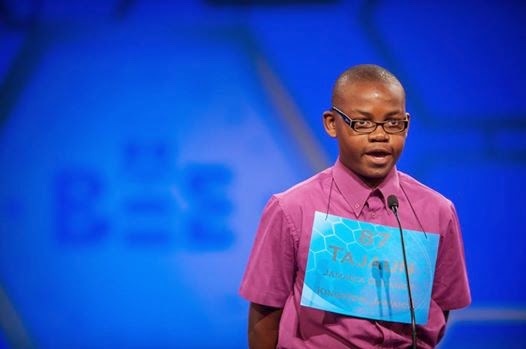 E-X-E-M-P-L-A-R-Y: From a field of approximately 280 whiz kids from around the world, Jamaica’s Tajaun Gibbison placed 10th overall at Thursday’s Scripps Howard Spelling Bee Championship in Maryland, USA. The Knox College junior, 13 years old, advanced to the grand finale round (the top 12) after acing the rigorous preliminary round and semi-finals that saw several competitors being pulled from the contest on account of below-par results in the written exam administered earlier in the week. Gibbison, a son of Clarendon, was conditioned for the championship by veteran teacher and mentor Rev. Glen Archer, who famously coached a then 12-year-old Jodi-Ann Maxwell to an epic win in 1998.